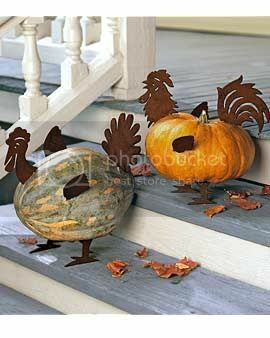 I like pumpkins on my porch but this is even cuter. Found it here. They have other vegetables with other styles (some on clearance for $4.88 – check out the zucchini dog). Love it. I probably won’t buy any until we’re moved but still wanted to share. Those are really a great idea! and very festive. I am excited for fall already! Ready for the colors on the leaves to change and drinking hot cocoa. Love it! Thanks for sharing! Cute new blog! those are so cute! i’m definitely going to have to make ’em!! any luck on your house? any lookers? i’m still praying for you :).